"I knew he was a remarkable man, but this magical side, as a painter, came as a surprise to me." In London, they keep Winston Churchill's war rooms from World War II just as they were during his finest hour. At Churchill College Cambridge, they have archived his papers and photographs. 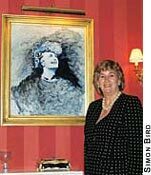 But at the Churchill Heritage, they watch over a special part of Sir Winston Churchill's history and his heart: his paintings. "Many people don't realize that Winston Churchill's greatest pastime was painting," says Minnie S. Churchill, the director of Churchill Heritage. "He once wrote: ‘Happy are the painters, for they shall not be lonely. Light and colour, peace and hope, will keep them company to the end, or almost to the end, of the day.'" Tracking down the whereabouts of Sir Winston's paintings has been Minnie's focus for the past six years as the collaborator, with David Coombs, on the monumental new book, Sir Winston Churchill: His Life and His Paintings. The only painting by Sir Winston of his wife, Clementine, is on loan from Minnie to the National Trust. It hangs in Lady Churchill's sitting room at Chartwell. Sir Winston painted it from a photograph taken at the launching of HMS Indomitable. He worked from a projected image of the photo - which was inadvertently put into the projector the wrong way around. Sir Winston was a prodigious painter, producing more than 500 oils and exhibiting at London's prestigious Royal Academy. He gave a number of his canvases away - to family members, friends and staff (including Grace Hamblin, his devoted secretary), and world leaders (FDR, Dwight Eisenhower and Her Majesty Queen Elizabeth II among them). Grace Hamblin's painting, for example, had found its way from Westerham, next door to Churchill's country estate in Kent, to the U.S. It was one of many of his delightful "daubs," as Churchill referred to his paintings, that ended up in America. His paintings can also be found in galleries and private collections throughout the world. The greatest collection of his paintings is at Chartwell, his beloved country estate in Kent, which the National Trust now owns. Many are exhibited in the studio he built, indulging another passion of his - bricklaying. Many of his paintings are exhibited in the studio he built, indulging another passion of his - bricklaying. reaction was: ‘These are absolutely wonderful'," Minnie recalls. "I knew he was a remarkable man, but this magical side, as a painter, came as a complete surprise to me. The paintings were so beautiful, and exhibited such a private insight into this great man's life." Another Churchill painting that Minnie owns features a coastal scene near Cap D'Ail in France. When Minnie's uncle, Prince Jean Louis de Faucigny-Lucinge, came to visit her and saw the painting, he placed the scene immediately - the house in the painting was his. 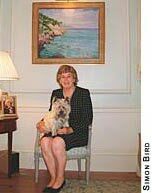 Admiring the paintings with Minnie is her cairn terrier, Tilly. charming message penned on the back and signed by Clementine S. Churchill. Minnie has loaned the painting to Chartwell, where it hangs in Lady Churchill's sitting room, opposite the famous painting of Sir Winston by Sir Oswald Birley. "When you tour Chartwell," says Minnie, "you see many of his paintings, which illustrate in glorious colors so much of his life and his travels." Minnie's collaboration with David Coombs on this book was, she says, a way to honor the memory of a great man who was also a fine painter. 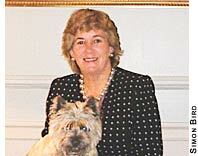 "It was a journey for me," she says, "a way to give something back." Churchill knew something about rewarding journeys, too. In his Painting as a Pastime, he wrote: "Painting is a companion with whom one may hope to walk a great part of life's journey." With the publication of Sir Winston Churchill: His Life and His Paintings, that journey will now be part of history.